Paul and Mary Grealish and the staff of The Kings Head Bistro at 15 High Street, Galway are inviting people to join them on Thursday next March 8 from 12.30pm to 2.30pm for a special lunch to celebrate International Women’s Day. The event will support the work of Gorta Self Help Africa with some of its Women and Family projects in Africa, with tickets priced at €25 for a special three-course meal with all proceeds going to the charity and to mark International Women’s Day. “We are aware that you will be making plans in the days and weeks ahead, and you might consider factoring it into your plans if you, your friends and your colleagues and staff are interested in attending. It could also be an early Mother’s Day treat,” said Gorta Self Help Africa’s Ronan Scully. International Women’s Day Lunch for Gorta Self Help Africa’ will be an opportunity for you to have fun, raise awareness and do some fundraising to support women and families living in some of the poorest communities in Africa. Gorta Self Help Africa works with these communities – provide women and families with the ability to produce more food, earn more from their farming activities and helps mothers and fathers to provide a better life for their children. Guest speaker at this special event in The Kings Head Bistro will be Mary Sweeney of Gorta Self Help Africa who has worked on Women and Children’s projects in Africa for the past 30 years and she will share with you her great experience and stories of some fantastic women doing great work to make lives better for their families in some of the poorest regions in our world. 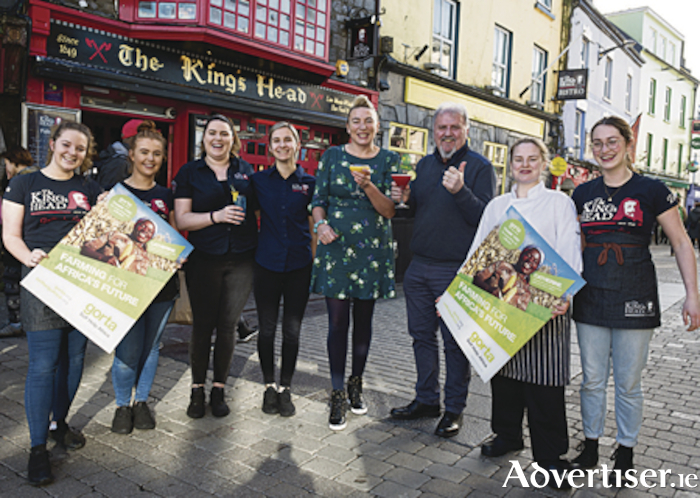 Gorta Self Help Africa’ is encouraging people to come to The Kings Head Bistro March 8 to support the charity’s work with women and families in 10 countries in Africa. So please join them from 12.30pm to 2.30pm and raise much needed funds and donate to Gorta Self Help Africa and give hope this International Women’s Day. “We would be grateful if you would give this event at the Kings Head Bistro/Restaurant your consideration in the coming days. If you would like to buy a ticket for this event please contact The Kings Head at (091 ) 566 630 or Ronan Scully at (087 ) 6189094 or email [email protected] or [email protected],” said a spokesperson.